This concrete fish barrier is being installed on Silver Bow Creek in Durant Canyon, west of Butte, to keep non-native species of trout from intermingling with west slope cutthroat trout and potentially out-competing the native fish or hybridizing it. The creek is currently rerouted in the area in a pipe to allow for construction, which should be completed in mid-October. To fishermen and women wading in the waters of the Big Hole River or Silver Bow Creek, seeing the spotted back and reddish gills of the west slope cutthroat trout may be commonplace. But the fish is threatened by other fish species and in some places occupies less than 10 percent of its historic habitat. Overfishing, habitat degradation, mining and poor grazing practices have, especially on the east side of the Continental Divide, taken their toll. So biologists are taking steps to protect the native species. On the Big Hole River – in the Upper Missouri River drainage – this means removing invasive fish species. On Silver Bow Creek – in the Clark Fork River drainage – the Natural Resource Damage Program is funding the installation of a fish barrier to keep invasive species out of German Gulch and Brown's Gulch. This summer, Olsen and a crew visited Pintler Creek and its headwaters at Oreamnos Lake in the Pintler Wilderness to remove introduced rainbow trout from the creek. Rainbow trout and cutthroats spawn at the same time and are thus able to hybridize, creating “cutbows,” which are able to reproduce but are generally considered a weaker, less fit fish. Olsen’s crew used a chemical piscicide called Rotenone, which is developed from tropical plants in the bean family that is a highly potent toxin to fish. The crew applied Rotenone, in a concentration of 50 parts per billion mixed in water, to the stream in the lake to kill the rainbow trout all the way to a downstream waterfall. At the waterfall, the biologist put potassium permanganate in the river, which neutralizes the piscicide. Rotenone is also rendered inert in the bodies of the dead fish within 24 hours, and the fish usually completely decompose in a few weeks. Though it would take a high dose of Rotenone to harm humans or other animals, the crew posted warnings to not eat fish pulled from the creek for several days after the chemical application. On the west side of the Divide, one of the positives to come out of Silver Bow Creek’s state as an essentially dead stream for a century is that native, genetically pure cutthroat trout populations were isolated in Brown’s and German gulches, protecting the fish from hybridizing with rainbow trout or being outcompeted by brown and brook trout. 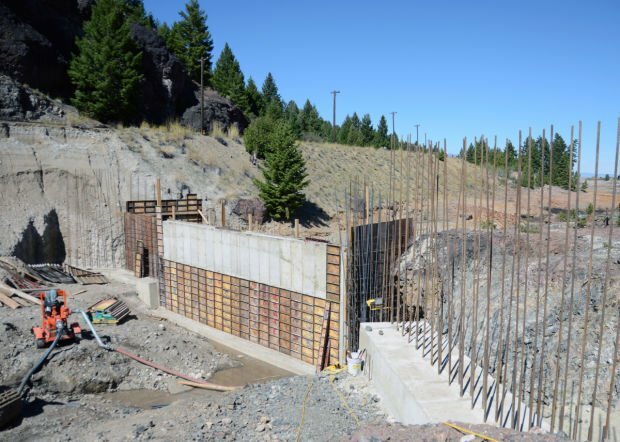 To ensure that these populations can flourish, a Natural Resource Damage Program-funded concrete fish barrier is being erected in Silver Bow Creek on the western end of Durant Canyon, west of Butte. The $500,000 structure will prevent fish from swimming up the creek. It’s also built to withstand a 100-year flood event. And crews are sloping the creek as it approaches the barrier to prevent as much sedimentation behind it as possible. “Originally this barrier was designed to protect the cutthroat fishery in German Gulch. But we moved it here to keep the connectivity in German Gulch, Brown’s Gulch and Blacktail Creek instead of isolating the tributaries,” said Jason Lindstrom, Upper Clark Fork fisheries biologist for Montana Department of Fish, Wildlife and Parks. Lindstrom added that the barrier, which will be completed in mid-October, is designed to be safe for recreationists. The barrier will have a sloped face that drops down to a splash pad. The shallow splash pad and high wall will prevent fish from jumping over the barrier while allowing water to continue to flow downstream. People from the NRDP, as well as FWP and the Montana Department of Environmental Quality say the renewal of Silver Bow Creek has been astounding and they want to keep it that way.